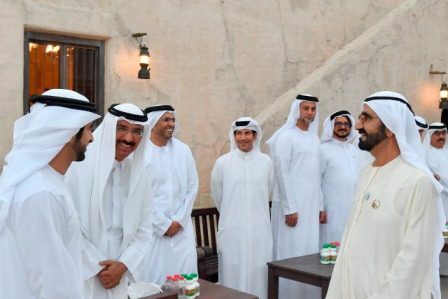 The Vice President and Prime Minister of the UAE and Ruler of Dubai, His Highness Sheikh Mohammed bin Rashid Al Maktoum, received a number of top executives and officials from Dubai government entities who came to congratulate His Highness on the advent of the holy month of Ramadan. The meeting at the historical Shindagha area in Bur Dubai was also attended by Dubai Crown Prince H. H. Sheikh Hamdan bin Mohammed bin Rashid Al Maktoum. His Highness Sheikh Mohammed discussed with his guests boosting inter-emirate tourism to allow the new generation to reflect on the rich history and the ground-breaking development march of the UAE since its establishment. Sheikh Mohammed hosted an iftar banquet in honour of his guests. H.H. Sheikh Ahmed bin Saeed Al Maktoum, Chairman of Dubai Civil Aviation Authority, Chief Executive of Emirates Group, H.H. Sheikh Ahmed bin Mohammed bin Rashid Al Maktoum, Chairman of the Mohammed bin Rashid Al Maktoum Foundation, and H.H. Sheikh Mansour bin Mohammed bin Rashid Al Maktoum, and other officials attended the meeting and banquet.